FD254-RS485 / FR254-RS485 / FD404-RS485 / FR404-RS485 are our “Smart-Clocks” used as secondary clocks. They can be driven by FRANKLIN’s Quartz F Master Clock to provide accurate, continuously updated, synchronized time via simple two wire distribution. Case: Anodized extruded aluminum housing, viewed through a scratch resistant anti-glare lens. 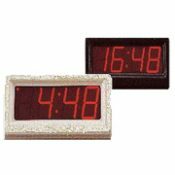 The FRANKLIN F1200 digital clock is an economical time piece which is used as a secondary clock in master clock systems. 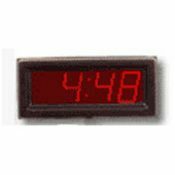 Clock time correction is performed by a programmed 24 VDC pulse for 1 second at exactly 12:00 midnight. This is an exclusive use of one channel programming to ensure this accurate event. If a power failure occurs, the quartz time base will maintain memory of correct time. Upon restoration of power, the clock will display the correct real time. The time base uses a 9 volt battery, which is NOT included. This battery will support the clock during power down situations for a total of 35 hours before needing replacement. Case: Vacuum formed ABS plastic housing with a sloped front that prevents reflective glare.